Bantamweight mixed martial artist Ian Loveland (14-9) has worked his way into the Ultimate Fighting Championship before, but even with nearly a decade in the sport, Loveland’s best days may still lie ahead. Up next is a co-main event bout at Tachi Palace Fights 13 on May 10 in Lemoore, Calif., where he will face Alexander Crispim (7-3). Although Loveland is taking the bout on short notice in place of fellow UFC vet Francisco Rivera, he isn’t worried about being ready. There is a good reason that Loveland feels like he can jump in against a tough opponent with little lead time. It’s the reason that his UFC stint, while far from a failure, didn’t go as well as he would’ve hoped. “When I was in the UFC, I still handled all of my strength and conditioning stuff on my own,” Loveland told ProMMAnow.com. Now he works with Phil Claud at Sports Lab Training Center, giving him a finely-tuned conditioning program to add to his MMA skills. Following a victory over Tyler Toner in his UFC debut, Loveland went the distance with former bantamweight title challenger Joseph Benavidez. 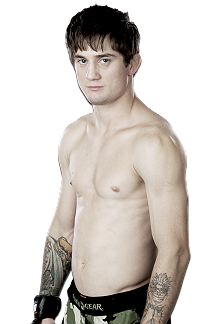 After losing a razor-thin split decision to Yves Jabouin at UFC 134, Loveland was cut. You could understand if Loveland felt discouraged by the setback. Unlike some, he had earned a UFC spot the hard way. In 2006 he ventured to Japan to fight longtime contender Akitoshi Tamura, competed in the now defunct International Fight League, and earned victories over fighters that later went on to compete in the UFC and WEC. Instead of pouting, Loveland is working hard to get another shot, training alongside the likes of Tyson Nam (11-4), Dave Jansen (17-2), and UFC welterweight Mike Pierce. As it turns out, TPF has helped launch and re-launch many UFC careers. But Loveland isn’t looking too far ahead, either. “I’m taking it one fight at a time and working on getting better” he said. “It’s been tough just finding a fight.